What happens when the Three Billy Goats Gruff get moved by the witness protection program from the land of folktales to the land of nursery rhymes? Quite a culture clash. And very possibly a physical clash when a troll moves into the house under the bridge, potentially derailing the potential romance between Little Boy Blue and Little Bo Peep in C. Lynn Johnson�s original play that won East Valley Children�s Theatre�s 2009 Aspiring Playwriting Contest. Joel Cranson directs a very entertaining show, giving us an inside glimpse into the real lives of nursery rhymes. You may not have known that Jack Be Nimble (Zeke Whiting) and Jack Horner (Andrew Gatti) are both arrogant royalty who have a thing for Little Bo Peep, or that the old woman who lived in a shoe (Kristen Moore) has moved out with some assistance by real estate agent Little Miss Muffet (Madison Vigiletti) and can no longer discern her children from her grandchildren (they all start to blend together after a while). Or that Itsy Bitsy Spider (Ellie Howard) is traumatized by water torture. Or that Mary Had A Little Lamb (Ashley Mount) was getting quite weary of her little lamb following her everywhere that she went, especially now that it�s been years and that �little lamb� is now a decrepit, old sheep (Benji Taylor) who�s wool is old and discolored, the poor thing. Or just how bratty and contrary Mary Quite Contrary (Alexis Roberge) really is. Or just how ambivalent the Marys and all nursery rhymes can be to non-nursery rhymes! The only ones who are really nice and welcoming to the goats are Little Boy Blue and the shepherdess next door, Little Bo Peep � good friends who could be more if Little Boy Blue can pluck up the courage. Connor Wince is a very likable and shy Little Boy Blue, with Hailey Johnson expertly embodying the sweet and mature Little Bo Peep who can also get a bit ticked when a misunderstanding has Little Boy Blue suddenly giving her the cold shoulder. 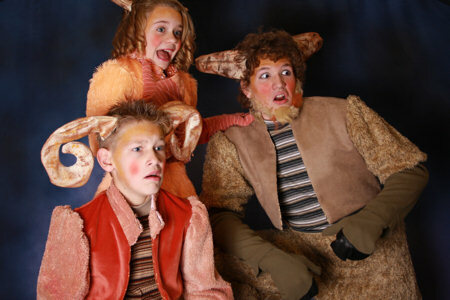 Aiding (and accidentally sabotaging) their potential romance are the three well-meaning Billy Goats Gruff siblings featuring three very impressive performances. Mike Bogle is the big, brave, but mostly brainless Bully Goat Gruff. Trent Tyson is the swift-footed and pragmatic Billy Goat Gruff. And eleven-year-old Zoe Whiting is fantastic as the kind-hearted, empathetic, and determined Millie whose emotions of love, fear, and happiness are always genuine and tangible. Emotions that inspire her to a lot of meddling, which is what got them needing the witness protection program to begin with, and which this time could get them kicked out of the Land of Nursery Rhymes and in a lot of trouble with a cranky troll. Said troll is played with a terrific blend of boorishness and sympathetic charm by Daniel Bos who is surprised and touched when he thinks Little Bo Peep may be in love with him! The show boasts an exceptionally talented cast that, together and individually, make the inhabitants feel full and real with strong personalities and good humor. Making them even more real is the beautiful collection of costumes designed by Barbara Jakucki with visuals completed by Dori Brown transporting us into her picturesque setting of the Land of Nursery Rhymes.